The talk will offer a glimpse into the rich and complex history of legal institutions and the laws of India — from its ancient origins through the colonial period to the present. To tell the entire story, one would need the tirelessness of Ganesha and the inspiration of Vyasa, a task well beyond the present attempt. However the talk will attempt to introduce the listeners to a brief study of the journey of our laws and courts, through a past so vast and often violent, layered with stories of inspirations and encounters, so complex and diverse, that it all makes for a very fascinating study. Mr. N.L. Rajah is a designated Senior Advocate practising in the Madras High Court. He was called to the bar in 1986 and started his practice under Mr. S. Govind Swaminadhan, former Advocate General of Tamil Nadu. He has a very extensive exposure in the field of Writs, Original side, Drafting and Conveyancing, Arbitration, Consumer Protection Laws and Energy Laws. Mr. Rajah is actively associated with several bodies dedicated to creating awareness among consumers about their rights and helping them to realise the same. He is a Founding Director of the Nani Palkhivala Arbitration Centre, a Centre recognised by the Madras High Court to render administrative assistance in arbitration matters. He is also a trustee of the Palkhivala Foundation. He was member of the committee formed by the Law Commission of India to suggest changes and amendments to the Arbitration and Conciliation Act 1996. He was a member of Justice D.P.Wadhwa committee for study of effectiveness of Public Distribution System in Tamilnadu. He is an invitee of the International Visitorship Programme of the U.S.Government in the year 2000. He is a trustee of the renowned Dr. M.S.Swaminathan Research Foundation (MSSRF) and a member of the management committee of the National College, Trichy, one of the oldest educational institutions in Tamilnadu, founded by his family in 1919. ‘Consumer Protection in India’ co-authored with Justice. D.P.Wadhwa retired judge of the Supreme Court of India. 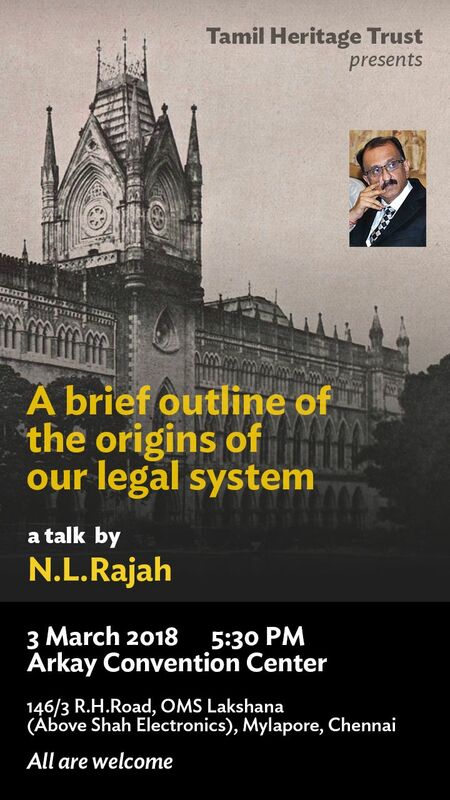 “A 150-year journey from a crown court to a people’s court” on the history of Madras High Court. “An Iconic splendour”. Assisted Heritage Committee of Madras High Court to bring out this book, on the heritage value of the buildings, on the occasion of 125th year celebrations of Madras High Court. “Courts of India” published by the Supreme Court of India and released on 26th Nov. 2016 by the Hon’ble Chief Justice of India. Many members of THT have attended his “Heritage Walk of the Madras High Court” which is conducted second Sunday of every month.